Hurricane Irma is edging closer and closer to Florida as millions of residents — more than 200,000 of whom are without power — brace for the impact of the most powerful Atlantic storm in a decade. The National Weather Service measured a 74-mph gust in the Florida Keys on Saturday night, marking the beginning of hurricane-force winds that forecasters say will steadily intensify in the coming hours. A tornado watch is in effect across the area, and two such twisters have already been reported. As of 12 a.m. Sunday, Irma’s center was about 80 miles southeast of Key West with sustained winds of 120 mph. It was moving northwest at 6mph, and is expected to turn north and head up the western coast of Florida, making landfall on Sunday. The worst and most extreme winds from Irma will begin to impact the Florida Keys shortly after midnight, with the center of Irma expected to pass over the Keys between 6 a.m. and 9 a.m. ET, Peck said. The storm, which was downgraded to Category 3 after making landfall as a rare Category 5 hurricane in Cuba overnight, has sent 75,000 people into shelters in Florida. More than six million people have been warned to evacuate its path. A slew of counties and cities in south Florida have issued curfews. Counties include Broward, Flagler, Orange, Palm Beach, Volusia, and Seminole. 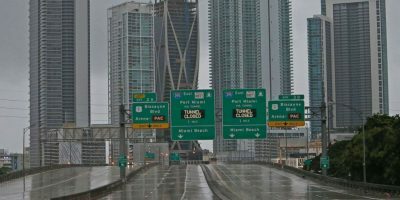 The cities of Miami, Miami Beach, North Miami Beach, Homestead, Key Biscayne, Melbourne Beach, Coral Springs, and Coral Gables also issued curfews. Palm Beach and Broward counties entered a curfew earlier this afternoon, and Charlotte County and the City of Miami Beach will enter one later tonight. Some 10,000 flights have been cancelled in anticipation of Irma, about 7,000 of them in Florida alone. President Trump tweeted a video from a Cabinet meeting Saturday, telling people to “get out of” Irma’s way. “Property is replaceable but lives are not. and safety has to come first. Don’t worry about it, get out of its way,” Trump said. Florida Gov. Rick Scott called the storm unprecedented. ABC News meteorologists are forecasting storm surges of 10 feet in Tampa and Sarasota, and 10 to 15 feet from Fort Myers to Naples. Somewhat lower storm surges of 3 to 6 feet may occur from Miami to Key Largo. Winds were already picking up in Florida early Saturday, with gusts between 40 and 60 mph. Hurricane-force winds with gusts over 115 mph are possible in the Keys by daybreak Sunday. As of 11:30 p.m. ET Saturday, more than 200,000 customers of various Florida utility companies were without power. Florida Power and Light said 196,350 of its customers were without power. Keys Energy, which serves the Keys, said all of its 29,000 customers were without power. Another 10,000 customers of other utilities were in the dark around the state. The state’s residents should anticipate days-long power outages, FEMA said. Ahead of Irma’s arrival in the Sunshine State, the last flights departed Friday night from Miami International Airport and Fort Lauderdale-Hollywood International Airport. Miami’s airport officially remains open, while Fort Lauderdale’s airport is closed for Saturday and Sunday. Many ATM machines across southwest Florida were out of cash by late Friday night after people stocked up in case Hurricane Irma causes power outages that make debit and credit card transactions impossible, The Associated Press reported. The?National Hurricane Center?on Friday cautioned that Irma’s winds would likely be strong enough to uproot trees, bring down power poles and rip off the roofs and some exterior walls of well-built frame homes. Approximately 6.3 million Floridians are under mandatory or voluntary evacuations, the Florida Division of Emergency Management said Saturday. When evacuation orders in South Carolina and Georgia are included, the number climbs to 6.8 million. An aerial photo shows the damage from Hurricane Irma on the Caribbean island of St. Martin, Sept. 6, 2017. Germain Arena, a large shelter between Naples and Fort Myers along Florida’s west coast, is already at capacity Saturday as hundreds of people were in line waiting to get in. Palm Beach County has issued a curfew to prevent looting and other criminal activity as the storm approaches, according to a press release. The curfew goes into effect Saturday at 3 p.m. It is unclear when it will be lifted. Broward County set a curfew for 4 p.m. Saturday and said no unauthorized vehicles will be allowed on the roads. At least 20 people have died and thousands were left homeless after Irma battered a string of Caribbean islands on Wednesday, according to the AP. At the time, Irma was a Category 5 hurricane with maximum sustained winds of 185 mph. At least three people died from the storm in the U.S. territory of Puerto Rico. The U.S. evacuated some 800 U.S. citizens from the island of St. Maarten on Saturday. Evacuees interviewed by ABC News upon arriving in Puerto Rico told stories about hiding in their hotel bathtubs fearing for their lives as the storm raged, a bank robbery and a gang of men with “long swords” who reportedly showed up at a hotel. Puckerin said a group of men armed with what she called “long swords” had stormed her hotel and beaten up a tourist. Others described looters stealing purses from hotel guests and how the Dutch military had arrived at their hotel in search of men who had just robbed a bank. The?Turks and Caicos islands?were also hit hard as Irma passed over the tiny archipelago in the?Atlantic Ocean. A government spokesperson told ABC News the British overseas territory had sustained “catastrophic” damage. Long, the FEMA administrator, said Friday that the agency’s primary goal is to “stabilize the?Virgin Islands?and Puerto Rico” by restoring power, maintaining security and bringing in life-sustaining supplies.